One of the things I’ve missed most doing the Whole 30 is my rice. Being gluten free I never really eat bread or pasta of the gluten free variety because in most cases it’s just not the same as it’s gluten filled relative. Rice on the other hand I miss, and with fall in the air my need for comfort food is kicking in. 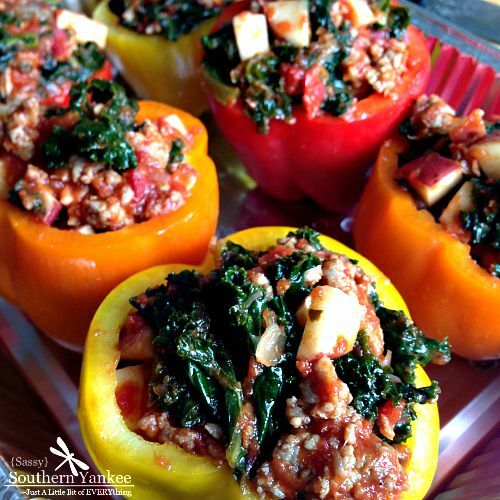 So… I’m happy to say that these Stuffed Peppers with Kale and Sausage hit the spot and are naturally gluten free, Whole 30 Compliant and Low Carb plus they have my favorite superfood Kale! This recipe for Stuffed Peppers with Kate and Sausage is quick and easy to make plus you can make them then freeze half to save you time another week. I’m all about two for one meals especially on those busy weeknights where I just don’t have time to cook. To get things started wash the potatoes and microwave for 3 minuets just begin the cooking process; then set aside for later. In a large pot or dutch oven add the ground pork, fennel, garlic powder, salt, pepper, and chili flakes. Cook over medium heat and use your metal spatula to break up the meat into fine pieces. If you have time in advance you can mix the meat and spices ahead of time for a more robust flavor allowing them to sit together in the fridge for 30 min to 24 hours helps “wake up” the spices. Once the meat is cooked through and browned add the kale and sauté until bright green and starting to wilt. Next add the jar of Marinara sauce and the diced potatoes; heat until warmed through. While the sauce and kale is heating up wash and dry your peppers. Using a sharp knife remove the tops of each of the peppers and scape the seeds and white pith out of the middle. Fill each pepper with about 1/2 to 1 cup of the mixture (depending on your pepper size). Place the peppers into a large baking dish with sides. Once all of your peppers are filled cover the pan with foil; then back at 375* for 30-45 minutes until the peppers are cooked to your desired softness. I like mine a bit crispy, so I tend to cook them less time. In a large pot or dutch oven add the ground pork, fennel, garlic powder, salt, pepper, and chili flakes. Cook over medium heat and use your metal spatula to break up the meat into fine pieces. If you have time in advance you can mix the meat and spices ahead of time for a more robust flavor allowing them to sit together in the fridge for 30 min to 24 hours helps "wake up" the spices. Fill each pepper with about ½ to 1 cup of the mixture (depending on your pepper size). Place the peppers into a large baking dish with sides. Once all of your peppers are filled cover the pan with foil; then back at 375* for 30-45 minutes until the peppers are cooked to your desired softness. I like mine a bit crispy, so I tend to cook them less time. Depending on the size of your peppers you will have filling left over which can be frozen and used later or you can buy a few extra peppers to stuff and freeze for a quick and easy meal later in the month. 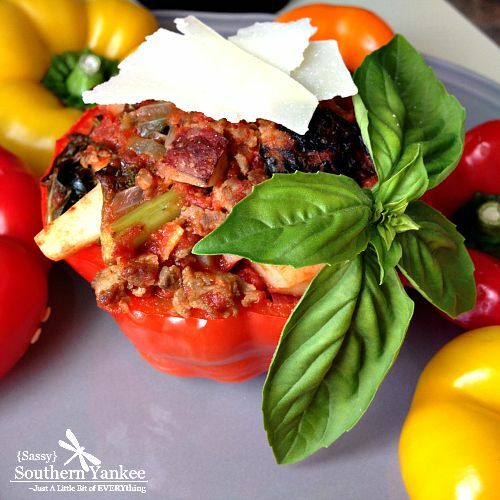 This entry was posted in Main Course and tagged Bell Peppers, Comfort Food, Gluten Free, kale, Low Carb, Peppers, sausage, Stuffed Peppers, Whole 30, Whole 30 Meals, Whole 30 Recipes.